My maternal great-uncle Robert MUTER, was born January 1894 in Cowdenbeath, Fife, Scotland to William Radcliffe (1856-1938) and Jane Brodie (1861-1938) (nee SWANSTON) MUTER. He possibly would have grown up in the house at 36 Joppa Road, Edinburgh where his parents lived, according to the 1901 census, with his three sisters, Jessie Brodie, Anne Mitchell (my grandmother) and Jean Swanston. A younger brother William died in November 1899 at aged 20 months. Robert was an apprentice photographer before migrating to Australia, possibly to one of the growing number of photographers in Princess Street, South Bridge or New Town, Edinburgh. Outside of London, Edinburgh had the largest number of photographers in Great Britain. Robert migrated to Australia when he was nineteen years of age on the S.S. Wilcannia from London, and arrived in Melbourne, Victoria on Monday 31 March 1913. On board with him were seven farmworkers, five British lads, and 37 nominated passengers. The remainder of those on board were persons who obtained reduced passage for the trip. Although his occupation in Scotland and on his enlistment papers state he was a Photographer, the shipping records have Robert listed as a labourer. This was possibly done so he could migrate, as labourers were more in need than photographers. Before his enlistment he was working as a farm labourer in Rupanyup, in the north western region of Victoria. Robert enlisted in 1st. A.I.F. one month after the First World War began, on 23 Aug 1914 at Murtoa, Victoria and was sent to A Company, 5th Battalion, A.I.F. at Broadmeadows, Victoria. The 5th Battalion was among one of the first battalions raised for the 1st Australian Imperial Forces, in 1914 and was recruited from Victoria. With the 6th, 7th and the 8th Battalions they formed the 2nd Brigade 1st A.I.F. With 2 months only at Broadmeadows, the battalion embarked from Melbourne on board the H.M.A.T. Orrito for Egypt, arriving on 2 December 1914. From there they took part in the second wave of the ANZAC’s landing on the 25 April 1915 at Gallipoli. During that campaign they saw action at ANZAC Cove and Cape Helles until the evacuation of Gallipoli in December 1915. Robert receive the first of many wounds during this campaign and was hospitalised in Malta on the 17 May 1915. He re-joined his unit at ANZAC Cove on 14 September 1915. After their withdrawal from Gallipoli the battalion returned to Egypt and in March 1919, sailed for France and the Western Front. On the 17 February 1916 he was transferred to 58th Battalion. This was a short posting. During this posting he was promoted to Lance Corporal on 27 February 1916. Next he was transferred to the 57th Battalion on the 6 April 1916 and was promoted to Corporal 13 May 1916. The 57th and 58th Battalions were raised in Egypt. Half of its enlistments were from the 5th and 6th Battalions and the other half reinforcements from Australia. He rose up through the ranks from this time and was appointed Lance Sergeant 21 July 1916, promoted to Sergeant 29 July 1916. On the 13 September 1916 was promoted 2nd Lieutenant by a Field Commission. By this this time the battalion had arrived in France and was fighting its first major battle on the Western Front at Fromelles. On the 23 January 1917 Robert was promoted to Lieutenant and six weeks later was again wounded in action with a gunshot wound to the knee and was transferred to 3rd London General Hospital at Wandsworth, and later to Cobham Hall Auxiliary Hospital, Kent, England. He did not return to his unit in France until January 1918. On the 25 April 1918 during the counter-attack at Villers-Bretonneux, France, by the Allied Forces, Robert received fatal gunshot wounds to leg and arms and died of the wounds the same day before reaching the 14th Australia Field Ambulance at Daours. For conspicuous gallantry and devotion to duty. During a raid, whilst his party was attempting to force an entry through the enemy wire, it was heavily bombed from the hostile trench. Vaulting over the wire he engaged six enemy with his revolver, thereby preventing the enemy bombing until his party had effected an entrance into the trench. By this bold and gallant act he not only prevented an attack from the enemy on his flank, but precluded the operation from resulting in a failure. The above has been promulgated in Commonwealth of Australia Gazette, No. 165 dated 24th October, 1918. 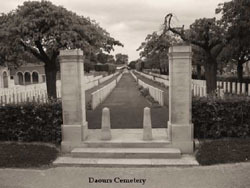 Lieutenant Robert MUTER is buried in the Daours Communal Cemetery Extension, Somme, France, Grave 15, Plot: 3, Row B. All of Robert MUTER’s personal belongings were lost at sea when the transport ship S.S. Barunga was torpedoed without warning and sunk by the German submarine on Monday 15 July 1918 with 700 Australian troops returning to Australia. The ship fortunately stayed afloat until all personnel were rescued by the escorting warships. In August 1919 a replacement medal was sent to his father by the Department of Defence, Melbourne, Victoria. The Memorial Scroll was presented in August 1921, and the Memorial Plaque December 1922. He also received his other medals 1914-15 Star, British War Medal and Victory Medal. 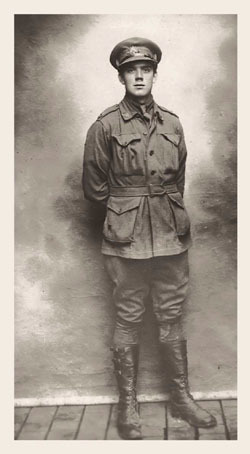 These along with the portrait of Lieutenant Robert MUTER and a memorial portrait presented by the Rupanyup District Citizens, are now held in the Australian War Museum, along with his Military Cross. This was donated by my grandmother Anne SIGGINS, his sister. Robert MUTER’s name is located at panel 164 in the Commemorative Area at the Australian War Memorial. Thus 25 April would have been a very momentous day for my grandmother and her family, as not only the remembrance of the ANZAC’s, but of her brother’s death in 1918.